Submitted by Gina Asprocolas on Thu, 02/02/2017 - 08:59. New York, NY—February 2, 2017—Scholastic (NASDAQ: SCHL), the global children’s publishing, education, and media company, has acquired world rights to an activism book written by Marley Dias, the 12 year-old social activist behind #1000BlackGirlBooks—an international movement to collect and donate children’s books that feature Black girls as the lead character. Marley is using her voice to advocate for social justice, a commitment reflected by her ambitious life goals: she dreams of becoming an editor of her very own magazine and plans to use media to spread positive messages and to perpetuate more socially conscious pop culture. The book will be published in Spring 2018 by Scholastic Press. 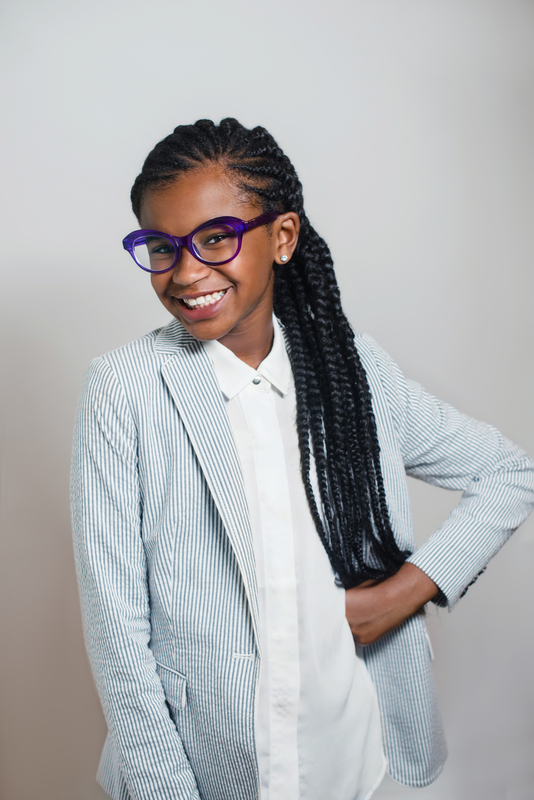 In her forthcoming nonfiction book for ages 10 and up, Marley Dias, the powerhouse girl-wonder who started the #1000blackgirlbooks campaign, shows kids how to make their own dreams come true. In this accessible “keep-it-real” guide, Marley tells how she’s turned her passion into a literacy crusade that has captured the attention of the media, policymakers, and young people throughout the world. Marley offers smart tips for “paying it forward” with whatever makes your heart sing, while getting support from parents, teachers, and friends to turn your dreams into reality. This book explores activism, social justice, volunteerism, equity and inclusion, using social media for good (not just makeup tutorials and angry tweets), and shows how young people can galvanize their strengths to make positive changes in our world. Also focusing on the importance of literacy and diversity, Marley offers suggestions on book selection, book-talking, and sharing titles. She delivers hands-on strategies for becoming a lifelong reader. She provides examples based on her extensive literacy advocacy and community work with schools and students throughout the world. Marley Dias is the promising, 12 year-old social activist behind #1000BlackGirlBooks, an international movement to collect and donate children’s books that feature Black girls as the lead character. Since birth, Marley has been immersed in the world of social activism, surrounded by a village of caring, concerned, active adults and children dedicated to service to humanity, and specifically people of African descent. When she was 5 years old, her mother, Dr. Janice Johnson Dias, co-founded the GrassROOTS Community Foundation (GCF), a public health and social action organization dedicated to the support and empowerment of people who live in impoverished communities, especially women and young girls. Her father, Scott Dias, is a Real Estate Analytical Geographer. Both parents have been instrumental in developing Marley’s understanding of key social justice issues and commitment to social change. When she became frustrated by a lack of Black female role models in her school books—and her mother asked her what she was going to do about it—she knew exactly how to respond. With the help of GrassROOTS, Marley launched the #1000BlackGirlBooks drive in November of 2015, leveraging the power of social media to reach a large audience. The goal was to collect 1,000 books featuring Black female protagonists by February 2016. The story went viral and was picked up by media outlets around the world as well as bloggers, schools, youth-focused organizations and thousands of individuals who wanted to participate in the project. In addition to features in major media outlets such as Elle, People, Jezebel, PhillyVoice, FOX29’s Good Day Philadelphia and The Huffington Post (to name a few), the initiative quickly gained support from literary partners including Barnes & Noble, My Very Own Library, Scholastic, and Putnam Books, which have donated books and funds to the cause. Well-known authors and artists including Jacqueline Woodson and Rita Williams-Garcia have contributed books as well. In light of the campaign’s huge success, Marley has appeared on Ellen (where she received a laptop and a $10,000 contribution from Shutterfly), The Nightly Show with Larry Wilmore (where she received the show’s first ever “Golden Hunnit/Keep It 100” award), CBS This Morning and Charlie Rose. In addition, Marley was honored at BET’s Black Girls Rock! with a M.A.D. (Making a Difference) Award. Marley was named Editor in Residence of Elle.com July of 2016 where she interviewed Ava DuVernay, Misty Copeland and Hillary Clinton. Having collected over 8,000 books to-date, Marley has far exceeded #1000BlackGirlBooks’ goals. In February 2016, Marley and GrassROOTS Community Foundation donated over 1,000 of the books to Retreat School in the Parish of Saint Mary, Jamaica, where her mother grew up. Marley has also donated to The Henry C. Lea School in Philadelphia, Speedway Academies in Newark, New Jersey, Renzuli Academy in Connecticut, and St. Cloud Elementary in West Orange, New Jersey, where she was first inspired to launch the movement. In fact, the Town Council of West Orange held a session to recognize Marley for her inspiring proactive initiatives. Marley is also the winner of the National Pretty Brown Girl Day "Dream Big” Award, awarded to her at Spelman College in Atlanta, Georgia. She has also spoken at the White House’s United State of Women Conference where she shared the stage with Michelle Obama, Oprah, Sophia Bush and Amy Poehler. The seventh grader is only getting started, and will continue to provide young girls like herself with relatable role models through #1000BlackGirlBooks. Marley is using her voice to advocate for social justice, a commitment reflected by her ambitious life goals: she dreams of founding and editing her own magazine, and plans to use media to promote positive messages and to perpetuate more socially conscious pop culture. In December 2015, Marley and the GrassROOTS Community Foundation traveled to Ghana, West Africa, on a humanitarian mission to support the health and well-being of Ghanaian youth and their families. The trip included serving as health ambassadors for African Health Now and she helped to provide meals for children at local orphanages. Marley enjoys reading, dancing, listening to music, eating sushi and being active with her friends. She resides in West Orange, New Jersey, with her mother and father. Scholastic Corporation (NASDAQ: SCHL) is the world’s largest publisher and distributor of children’s books, a leading provider of print and digital instructional materials for pre-K to grade 12, and a producer of educational and entertaining children’s media. The Company creates quality books and ebooks, print and technology-based learning materials and programs, classroom magazines and other products that, in combination, offer schools customized solutions to support children’s learning both at school and at home. The Company also makes quality, affordable books available to all children through school-based book clubs and book fairs. With a 96 year history of service to schools and families, Scholastic continues to carry out its commitment to “Open a World of Possible” for all children. Learn more at www.scholastic.com.